Give your rooms a new look with a fresh coat of paint. You can even paint laminate panels to inject new and invigorating color into a room. Prepare the paneling surface properly before you paint to ensure the paint will adhere correctly to the laminate surface. With careful attention to preparation details, you can cover old paneling and give your old walls a new look that will last for years. Paint laminate panels to give a room a new look. Lay down the drop cloth to protect the floor near the walls you will be painting. Sand the entire laminate paneling wall surface with the sandpaper to eliminate the shine on the paneling completely. Wipe the paneling well with the tack cloth to remove all dust and debris from sanding. Tape off the ceiling, adjoining walls and the baseboard with the painter's tape to prevent primer and paint from spreading onto these surfaces. Apply tape around any windows and outlets. Apply the primer to the laminate paneling using the paintbrush first around the perimeters and then filling in the center area with the paint roller. Apply the primer in an even coat, covering the paneling completely. Allow the primer to dry and cure. Consult the label on the primer for the proper curing time--it may be as long as one week. You must wait this length of time before painting to ensure your paint adheres properly over the primer. Apply the latex paint over the cured primer using the same painting technique you used to apply the primer. Allow the first paint layer to dry for at least eight hours and then apply a second coat of paint. 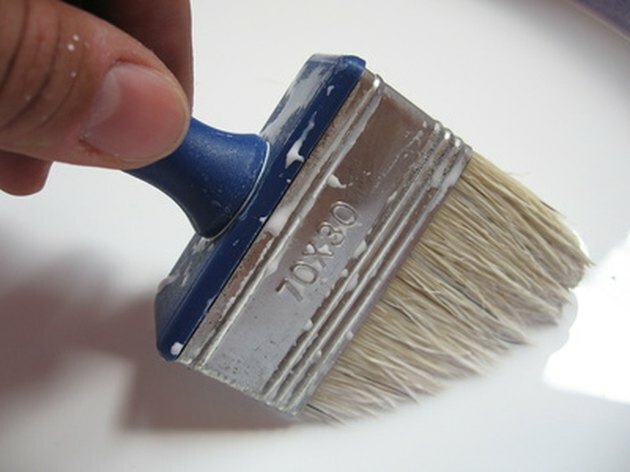 Remove the painter's tape after the second coat of paint dries completely.